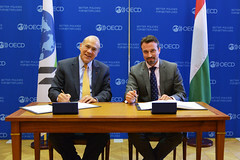 12/11/2013 - OECD Secretary-General Angel Gurría welcomed today Hungary’s steps to strengthen international tax co-operation after it became the 61st signatory to the Multilateral Convention on Mutual Administrative Assistance in Tax Matters. Hungary’s Minister of State for Taxation and Financial Policy Affairs Orbán Gábor signed the Convention during a ceremony at the OECD in Paris. Mr Gurría welcomed Hungary’s recent steps toward greater tax transparency. “Today’s signing is an important signal that Hungary is seriously committed to the international fight against offshore tax avoidance and evasion,” he said. Mr. Gurría noted that the rapid increase in signatories to the Convention reflects the growing levels of international support for exchange of information on request. OECD Secretary-General Angel Gurría and Hungary’s Minister of State for Taxation and Financial Policy Affairs Orbán Gábor at today’s signing ceremony. Hungary’s signing comes one week before the 21-22 November meeting of the Global Forum on Transparency and Exchange of Information for Tax Purposes, in Jakarta, Indonesia, at which a number of additional countries and jurisdictions are expected to sign the Convention. The Multilateral Convention provides for all forms of mutual assistance: exchange on request, spontaneous exchange, tax examinations abroad, simultaneous tax examinations and assistance in tax collection, while protecting taxpayers’ rights. It also provides the option to undertake automatic exchange, requiring an agreement between the Parties interested in adopting this form of assistance. The Convention must now be ratified by Hungary. The 61 signatories to the Convention are: Albania, Andorra, Argentina, Australia, Austria, Azerbaijan, Belgium, Belize, Brazil, Canada, Chile, China, Colombia, Costa Rica, Croatia, Czech Republic, Denmark, Estonia, Finland, France, Georgia, Germany, Ghana, Greece, Guatemala, Hungary, Iceland, India, Indonesia, Ireland, Italy, Japan, Korea, Latvia, Lithuania, Luxembourg, Malta, Mexico, Moldova, Morocco, Netherlands, New Zealand, Nigeria, Norway, Poland, Portugal, Romania, Russian Federation, Saudi Arabia, Singapore, Slovak Republic, Slovenia, South Africa, Spain, Sweden, Switzerland, Tunisia, Turkey, Ukraine, United Kingdom, and United States.